Adolph Rupp: Myth, Legend & Fact is a two-hour documentary focusing on the famous Kentucky basketball coach. 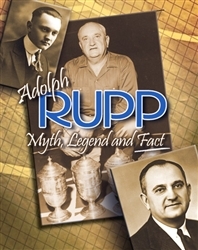 The documentary, produced by WKYT television, tackles conflicting opinions about Rupp and race and features interviews from numerous key players. A must-have collectible for UK fans.